This Hy-Pro pool table with its full table unique design will give you hours of fun challenging your friends and family alike. Featuring two cues and the American-style spot and stripe balls. Spots and stripes american pool balls and 2 cues. 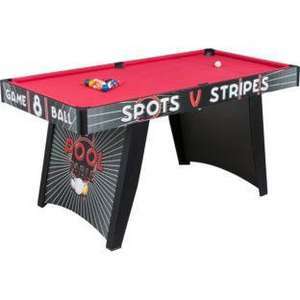 Full table unique design with pool hall style red cloth. Def a good price, but the previous models of this table got really bad reviews (sloped/warped etc), so I am wary. Still, am on the look out for a half-decent cheap table.